My 4 year old daughter and I saw the same thing near Marshfield, Wi around 9:05 November 15th. Yes, I saw these also tonight, 11/16/11. I only saw 3 red lights slowly appearing in a diagonal line in the west around 5:00 pm right over the city of Ripon. 4 hours later I heard very loud low flying jets, very unusual for our area. I saw the same lights Wednesday Nov. 16, 2011 driving west through Ripon on 23 heading to Walgreens a little after 6:00 pm. I live just south of Ripon and around 9:00 pm I heard loud jets flying above my house. I went outside and saw what appeared to be 4 or 5 fighter jets flying in very irregular patterns. One of them looked like it was chasing something. The whole group moved gradually to the southwest. I also witnessed that in the Green Lake Wisconsin area at about 6:00 pm on the 16th from my house, and also have seen it on the 15th while I was driving home. I saw a small white light moving fast across the sky and it left a "tail" of orange lights behind it that looked like they where falling but quickly would fade away. I saw the same exact thing over Berlin WI on Monday November 14 2011. I was traveling west through town when I seen it. I thought I was crazy until I saw this video. I heard the jets on Nov 16th. Woke me from a dead sleep they were so loud. Thought I had dreamed it. I just saw the same thing tonight at about 6:00. I live in the city of Berlin and it seemed like it was almost on top of us looking west towards WalMart.. I came in the house and went on face book to see if anyone else saw it and then someone gave me this link and now I know I'm not nuts... It was just about the same but I saw individual orange lights appear and then when they went away another one came up.. when the total of about six of them stopped the one that's in this video came up and you could hear a deep rumbling after the lights disappeared..
yes i was in ripon about 5pm and saw three lights all in a straight line . commented about it to my family, about two or three hours later, at home, south of Ripon, I watched as 5 to seven fighter jets were very low and the scene was very odd. I was on my way home from work in FDL, I was heading west on Hwy. 23 and was halfway between Rosendale and Ripon. It was about 5:30 pm. I noticed what seemed like 3 lights in the southwest sky, thinking they were 3 planes very close to each other. It remember thinking they were going to crash into each other. I paid close attention to it since even though I thought they were planes, they were not moving. They were stationery, not moving like they werre planes. Then all of a sudden the lights were gone. Just gone. I didn't think anything further about it then until I heard others talking about possible UFOs. I seen these on 11/15/2011, now 11/17/2011 tonight were more red lights and one aircraft going towards it and then another, pretty soon had to be about 15-20 aircraft covering the whole sky in every direction.. I have never seen so many aircraft in the sky before. It seems nobody knows what it was, at first I thought flares but there was no craft around to drop them so that rules that option out, plus why would so many aircraft be scattered like it was if it was training, I've never seen anything like his before. MAN! 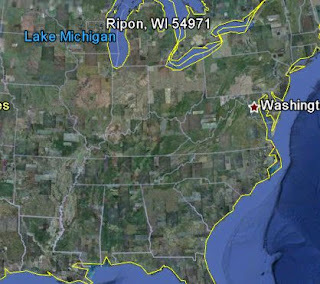 I live between Ripon and GL and missed it ALL! Awesome video! *Edit* To my orig post - I seen these on 11/15/2011, now 11/17/2011 tonight were more red lights and one aircraft going towards it and then another, pretty soon had to be about 15-20 aircraft covering the whole sky in every direction.. I have never seen so many aircraft in the sky before. It seems nobody knows what it was, at first I thought flares but there was no craft around to drop them so that rules that option out, plus why would so many aircraft be scattered like it was if it was training, I've never seen anything like his before. I was watching two of them circle around and one ended up going real low, kind of into the woods behind my house. I told the kids to just stay in the house while i went back to see if i could see anything. i walked about half a mile when i saw it actually had landed in a small barren patch of dirt. I saw about three really small skinny "people" coming in my direction, and thats really all i can remember. My family and I were driving back from getting ice cream in Ripon on Nov 16th, 2011 around 9pm and had to pull over on the side of road to watch the amazing sight in the sky.. We were on a side country road just west of HWY 23 - McConnell Rd.. We seen orange bursts in the sky several times and each time an object would shoot out of the burst and then stayed in position with a blinking light on it.. We also heard very loud jets at the same time... We have seen this activity for the past three years from our backyard on Hwy 23 just west of Ripon.. Would love to know more about it.. email classicssportsbar@yahoo.com if you have more info.. There's an awful lot of anonymous people in Wisconsin. I'm not sure if this adds up to a well-corroborated sighting, or a hoax. I was just thinking the same exact thing as you, lots of anonymous people without google accounts. I do remember seeing the same light pattern in a previous video on this site, or a later video I should say. I don't know what my husband and just saw (around 8:45) tonight near new Berlin wi. Two bright orange lights... Not a sound coming from them... Then one just disappeared. VERY strange... Unlike anything we've ever seen before. Tonight, 12/7/11, I was driving just west of Oshkosh on Hwy 21 and I saw two bright orange lights appear in the sky just to my southwest...then they faded away. About a second later a line of about 4 or 5 orange lights appeared, seemed to flicker, then one by one, they disappeared. I pulled over but couldn't hear a thing nor did the lights reappear. It was eerie. Seen this occurrence many times over the past 10 years. Once over the quarry in Ripon, but usually in the direction of Berlin, Waukau and Eureka. Not until coming across the videos on accident did I connect the dots. I'm an experienced aviation enthusiast who heard something I could not believe the night of nov 16 from my house in Neenah wi. The sound I heard was a sonic boom, completely shocked that they did that right over the city so I ran outside to see what they were and could make out twin engines with afterburners lit, f-18s. There were 4 of them in a line. I reported my disbelief to Facebook and uneducated people tried telling me it was a train or thunder but they've probably never heard a sonic boom before. I know what it sounds like and had visual confirmation. But until tonight I couldn't figure out why they were in such a rush. The scramble confirms to me that the govt was threatened by the ufo which indirectly tells me we have visitors. I noticed the same lights in the sky tonight (1/8/14) just before 6:00pm. The objects were observed in the sky west of Rosendale. Was this observed by others?